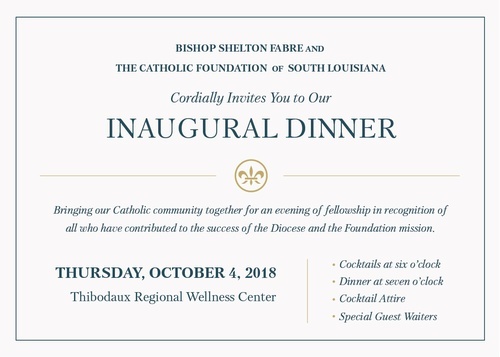 Bishop Shelton J. Fabre and The Catholic Foundation of South Louisiana announce the date of the Catholic Foundation’s Inaugural Dinner, October 4, 2018 at Thibodaux Regional Wellness Center. The inaugural dinner will bring our Catholic community together for an evening of fellowship in recognition of all who have contributed to the success of the Diocese and the Catholic Foundation’s mission. The event will begin with cocktails at 6 o’clock in the evening and dinner to follow at 7 with our diocesan seminarians as guest waiters for the evening. Tickets for the evening at $100 or a table of 8 for $800 and can be purchased through the Catholic Foundation of South Louisiana at catholicfoundationsl.org or by calling 985-850-3116. “We are looking forward to hosting this inaugural dinner as a way to gather our community together in thanksgiving for all of their generous support. Our Catholic Foundation and our Diocese have benefited from the fruits of many gracious people. We are eager to celebrate together all the Lord has blessed us with,” stated Bishop Fabre. During the evening Bishop Shelton Fabre will recognize one recipient of our inaugural Faith in Action Award to a layperson or permanent deacon who models Christian stewardship and has an outstanding record of volunteer service, high moral character and exemplary values. Nominations are open and forms can be found online at catholicfoundationsl.org. For more information about the inaugural dinner please contact executive director, Amy Ponson at 985-850-3116 or aponson@htdiocese.org. Tickets are $100 per person / table of 8 for $800. Can be purchased through the Catholic Foundation of South Louisiana at catholicfoundationsl.org or by calling 985-850-3116.